Would you like to welcome walkers and cyclists to your place of worship or practice on Saturday 14 September? Londoners will be finding sponsorship to visit as many as possible, with the proceeds split 50-50 between their own choice of local church, mosque, temple or other community and the Heritage for London Trust. Sadly, the date chosen clashes with the solemn day of Yom Kippur, so Jewish friends and synagogues are unlikely to be participating. Let’s hope significant days and dates are avoided next year. The BBC website has a good calendar for checking dates up to two years in advance. See whether your borough’s religious buildings are part of Ride+Stride on the HfLT website, which has a handy map. Wesley’s Chapel, the Shri Swaminarayan Mandir, the Swedish Church, the Royal Foundation of St Katharine, Wandsworth Quaker Meeting House and St Paul’s Cathedral are already signed up. Lambeth Council has integrated Ride + Stride into its Lambeth Heritage Festival. HfLT’s Alice Knight is happy to sign up new participants – she has some A2 posters to use as publicity which are free of charge. On the day, someone needs to welcome walkers and cyclists, tell them something about the heritage and sign their sponsorship forms. Juice and biscuits is an extra treat but not essential. Download the form and return it to Alice asap at contact@heritageoflondon.com. “Get on your bikes or put your best foot forward to raise much needed funds for London’s places of worship! Ride+Stride is a sponsored walk and cycle around religious buildings of all faiths and eras. The less energetic can also take part as many of these buildings are on major public transport routes. Participants are free to choose whatever route and distance suits them. In future, this scheme could link in with the Open University’s Building on History initiative, which Finchley and Wandsworth are pioneering. Many thanks to Jason Cobb for alerting LBFN to Ride + Stride. Guest posts are always welcome. Many thanks to John Woodhouse for reporting from Friday’s event. John runs Westminster Cathedral Inter Faith Group and a busy email list – please contact him for further information. Professor John Wolffe introduced the Building on History Project and we had a fascinating talk by Dr Clifford Hill on the Wilberforce Heritage in which he made it very clear that the legacy of slavery was still with us, notably in the 2011 riots. He pointed to white slavery as well as the black struggle. Wandsworth people from Christian, Muslim, Hindu, Jewish and Sikh traditions decided to move forward with a religious history project. Dr Tim Powell described the religious archives at the National Archives and a representative from the London Metropolitan Archive in Camberwell spoke. It struck me how people of faith may not know that their history is preserved in local collections like the Local History library at Battersea and Wandsworth Museum as well as National collections. We then heard from leaders from Baptist, Methodist, Anglican, New Testament (they have their own published history! ), Muslim, Jewish, Hindu and Sikh communities. Common themes began to emerge. There are many firsts in Wandsworth e.g. Quakers, Huguenots, temples. Many immigrant communities hung onto their faith in the face of opposition and struggled to get established. Youth work and community service were common themes. Moulana Ali Rizvi addressing the seminar. In the discussion that followed several themes emerged. Informing the younger generation about the past and using SACRE to help with funding. The John Cass foundation which is specifically for Wandsworth was mentioned as a source of funding. The council Green Plaque scheme and Wandsworth library, Balham Society, Putney Society, Battersea Society and especially Wandsworth Historical Society should be approached for help. A website and possibly a book for young people should be established and we were told that a London wide site is in progress. A fascinating afternoon and a lot was learnt about each other! The programme for the day can be downloaded here. Seven invitations – two of them are for tomorrow. 1 Wednesday 29th May at 5.30pm: Lecture by Dr Ismail Serageldin, Director of the Library of Alexandria, Memory, Culture and Hope: Reinventing Relations between the West and the Muslims, followed by a reception. The Drama Studio, Institute of Education (Main Building), 20 Bedford Way, London WC1H 0AL. Download invitation here. Please register at administration@egyptculture.org.uk. 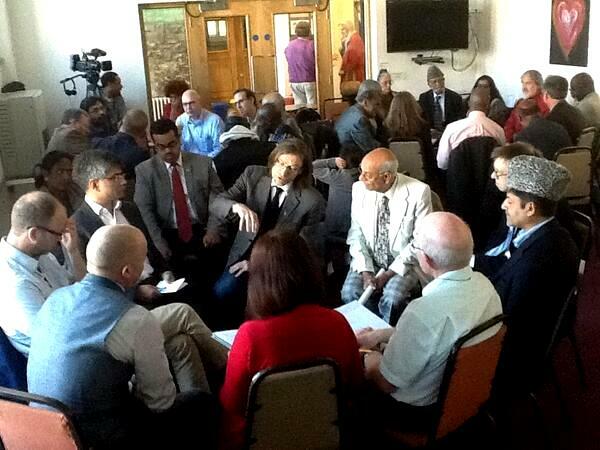 2 Wednesday 29th May at 6.30pm: Kensington and Chelsea Forum of Faiths: Inter Faith Prayers following the murder in Woolwich at Al Manaar, Muslim Cultural Heritage Centre, 244 Acklam Road W10 5YG. Contact Revd James Mather. 3 Thursday 30th May at 12.30pm: South London Inter Faith Group Lunch at Streatham Friends Meeting House, Redlands Way, Roupell Park Estate, Brixton Hill, SW2 3LU. As usual, a vegetarian lunch will be served at 12.30pm. Contact SLIFG at membership@southlondoninterfaith.org.uk. 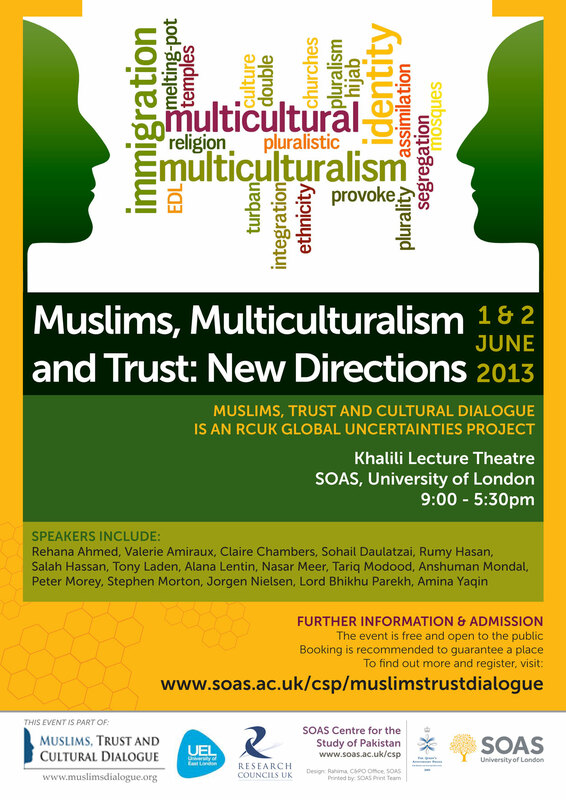 4 Saturday 1st June – Sunday 2nd June: SOAS, University of London, Conference, Muslims, Multiculturalism and Trust: New Directions. To consider the potential offered by lived experience and creative visions of intercultural exchange to offer new ways of envisaging multicultural experience. Speakers include Rehana Ahmed, Valerie Amiraux, Claire Chambers, Sohail Daulatzai, Rumy Hasan, Salah Hassan, Tony Laden, Alana Lentin, Nasar Meer, Tariq Modood, Anshuman Mondal, Peter Morey, Stephen Morton, Jorgen Nielsen, Lord Bhikhu Parekh, Amina Yaqin. 5 Friday 7th June at 6.30pm: The 2013 WPCT Lecture will be given by the German Ambassador, H.E. Georg Boomgarden, Valuing Europe beyond economics: what binds us together? at Europe House, 32 Smith Square, SW1P 3EU. Contact Win Burton. 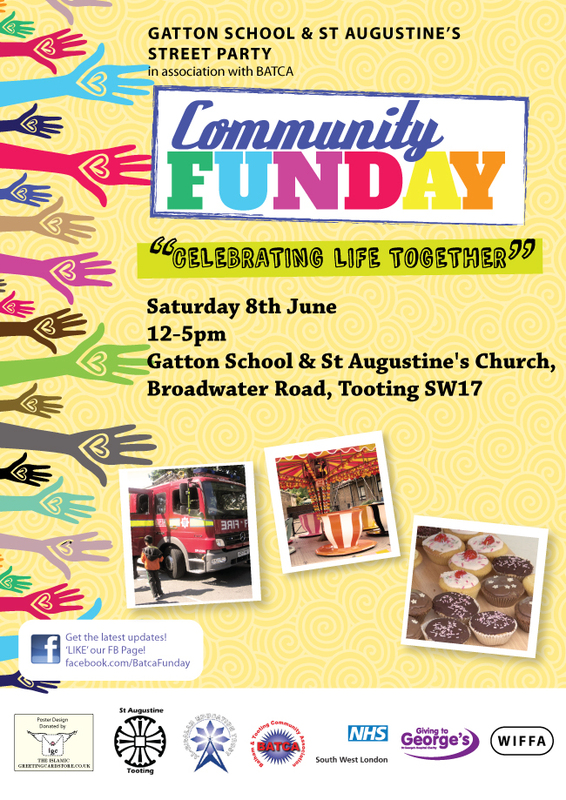 6 Saturday 8th June 12-5pm: BATCA Funday in Broadwater Road, Tooting, London SW17. Anglican church and Muslim school combine to provide fantastic afternoon of fun “Celebrating Life Together”. Attractions appeal to all including inflatables, fairground rides, clowns, sideshows, animals to pet from Kingston City Farm, arts and crafts workshops, sports, stalls run by craftspeople and stalls run by local voluntary and community organisations. Multicultural food will be on sale throughout the day. The road space will be closed to traffic and filled with attractions and stalls. Contact Kate Allan. 7 Friday 14th June 12-4pm: Exploring Religious History in Wandsworth, with the Open University. Balham Baptist Church, 21 Ramsden Road, London SW12 8QX. Wandsworth Community Empowerment Network and the OU’s Building on History team invite you to explore the religious history of the area and to discuss a prospective local religious history project. Contact Nadeene Morris. The Building on History project looks at how learning from the past can help us work towards a better future. We’ll be hearing from the OU’s Gavin Moorhead and John Maiden at our meeting tomorrow. This video clip mentions Croydon Mosque and includes Malik Gul of Wandsworth Community Empowerment Network. The next LBFN meeting will take place at 2pm on Thursday 28th February at Emmanuel Room, Central Hall Westminster, Storey’s Gate, SW1H 9NH. We are grateful to Elizabeth Simon of the London Church Leaders for kindly hosting our meeting, which will look back over significant changes in context since LBFN started 10 years ago. Gavin Moorhead and John Maiden will be giving us advance information on the Building on History project. We will also be meeting intern Tara Thiyagarajan for the first time. Please join us for this starry line-up and an unrivalled exchange of experience and expertise across London. Let me know by 26th February if you are planning to come.